Showing sheep is very relaxed. Having shown horses for many years I am not new to the show ring but it did surprise me how different sheep showing is to horses. The getting ready part is just the same! Many baths to give (purple shampoo is a must) to make them sparkle. Take most of the barn with you for “just in case”. Fit in practice standing quietly and walking. Check the trailer license .. It’s current.. Right? Did you show stock growing up? This is the same. Hang out with friends. Meet a lot of really great folks and talk Katahdin sheep. We will be at the Clark County Fair again this year with 5 animals to show and share with our community neighbors and friends. 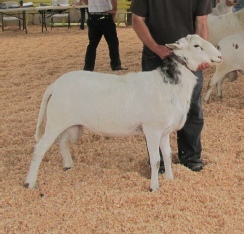 Showing sheep at the Clark County Fair, Ridgefield, WA.